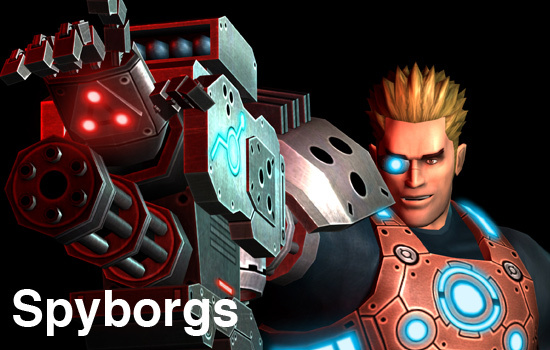 Spyborgs may look slick and modern, but beneath all the gloss, it is a very old school brawler. Your feelings about the game are going to come down to your enjoyment of this genre. There is nothing new here; in fact, it's quite the opposite. From the simple, straight forward level design, to the repetition of enemies, to the enormous (and satisfying) boss battles, Spyborgs feels much like Double Dragon, Battletoads, and other classic beat-em-ups. 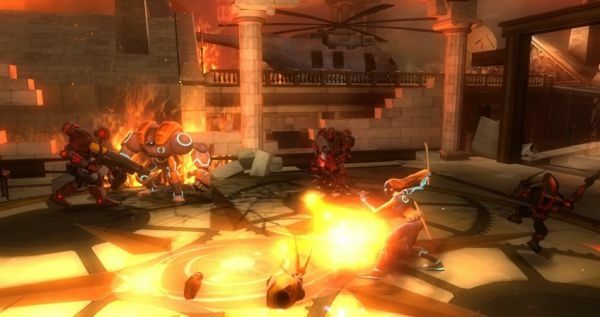 For gamers who enjoy those older games, Spyborgs is a decent experience, combining modern graphics and control schemes with older, familiar gameplay elements. For those who are not brawler fans, Spyborgs doesn't have much to offer. Three Spyborgs are available for selection in the game. These three fit the standards you'd expect. There's a quick, female ninja named Clandestine, a slow, gorilla-like titan named Bouncer, and Stinger, a gun-armed cyborg who is more balanced and has a nice ranged attack. As you destroy the hordes of enemies and generously scattered crates, all sorts of sparks fly out for you to collect. Blue sparks are for health, orange for special attacks, red for upgrades, and green grant invincibility. The upgrade menu is available at any time throughout play, which is convenient. At the beginning of each level, there is a brief audio clip explaining what passes for the story. This narrative is entirely forgettable. Even more straightforward than the plot is the level design. There are no optional paths or puzzle elements at all. Quite simply, you beat up the bad guys in one room, move to the next, and repeat the process. The sameness of the enemies only serves to emphasize the tedium of the gameplay. At the end of a series of levels, there is a boss battle. It's here that Spyborgs cranks it up a notch. The bosses are large, filling the entire field of play, and while there aren't really any tricks to defeating them, they are enjoyable for the sheer spectacle. The co-operative elements of Spyborgs, too, are exactly what you'd expect. A second player can drop in or out at any time. Players share a common pool of red sparks to purchase upgrades from. While each character can initiate a special attack alone, both players can participate in the combo finishers. These take the form of a quick time event, which means you and your buddy will have to make sure you waggle your remotes at just the right time. (Thankfully, you can disable the waggle and use button presses instead.) If one player falls in battle, he or she will be revived as soon as the other player clears out the remaining enemies. Spyborgs is competent, if not flashy, as far as the co-op is concerned. Page created in 0.2814 seconds.